Amid persistent rumors of substantial upgrades, the current Apple TV is beginning to show its age, losing ground in the streaming media device marketplace to rival Google Chromecast and Roku in the first three quarters of 2014, according to market researcher Parks Associates as reported by CNET. Apple's decline comes at a time when interest in streaming media devices is on the upswing, with 10 percent of households buying at least one media player this year. Despite a decent drop in market share over the past year amid increased competition, Roku remains the leader among set-top boxes and streaming media sticks, accounting for 29 percent of the market in the 9-month period, down from 46 percent in 2013. Google's Chromecast stick had a strong showing in 2014, climbing to the number two slot with 20 percent market share and knocking the Apple TV down to number three. With 17 percent share, the Apple TV remains in front of Amazon's Fire TV and Fire TV Stick, which together accounted for 10 percent market share, although the Fire TV stick is just now rolling out to consumers. The Apple TV was first introduced in 2007 and has been updated periodically during its seven-year lifespan. It currently remains in its third generation with the last major hardware update released in March 2012, followed by a minor revision in January 2013. Multiple rumors this year hinted at a refreshed Apple TV hardware with App Store integration, Bluetooth controller support, and more, but those rumors have yet to pan out. 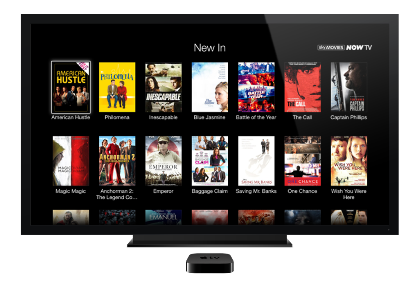 Though its Apple TV hardware has been essentially unchanged for over two and a half years, Apple continues to make improvements to the software and add new channels to the Apple TV lineup. Well, update the $%$# thing with something new/useful. Otherwise, a $30 stick that does everything you do for $99 is going to take market share from you. Apple needs a new 'hobby'. Not surprising. I'm still waiting for whatever Steve Jobs said he "cracked" with television. The ATV certainly isn't it. I use it to stream my iTunes stuff, but that's about it. So upsetting that Apple still is leaving this device largely abandoned. And Airplay has been SO BAD since iOS 8. Really problematic. When the Apple TV was released alongside the announcement of the iPhone, I was hoping Apple had big plans for it also. It's a real shame since there is so much potential. If Apple wants to get serious about it, I feel like the Apple TV could have a far bigger impact than an Apple Watch. TV is a stale industry that could use some major innovation. Watches are also stale, but I also don't see them having near as much potential as TV. If they'd spent less time on yearly iOS / OS X releases, we might have had an Apple TV app store by now. It's a $25 device. It should be outselling the Apple TV. I bought one just to have one. Didn't hurt my pockets at all. The Apple TV is hands down better than the cromecast though. I would buy one, but the Chromecast and Firestick are cheaper and more elegant. Apple is lagging on this and other areas unfortunately. Another missed opportunity for them. I gave up waiting for a new Apple TV and bought two Amazon Fire TVs yesterday. Apple needs a new LEADER, but that's just my opinion. I know other people think Tim is doing a great job; I think we'll look back in 10 years (or less) and find out that he was really just riding Jobs' coattails and really didn't offer that much of substance to the company.